NEWINGTON - As the clock read 0:00 and the scoreboard 25-7, the Newington football team celebrated its third victory of the season Friday night. While the Indians’ 3-2 record is something to be pleased with, the game against Bristol Eastern suggests there’s still a lot of work left to do. The Lancers came into the contest giving up an average of 41 points per game with the season-low against E.O. Smith, 23 points. Outside of Newington’s first two offensive possessions in which it drove down the field for touchdowns, the Indians’ offense struggled to find consistency most of the night. The Indians’ possessions after the start resulted in an interception, five punts, one turnover on downs and another pair of touchdowns. But both touchdowns weren’t a product of Newington’s success offensively, but rather a lack of ball control by the Lancers who turned it over to the Indians in the red zone for both of those scores. Following the game, Newington’s head coach Jason Pace wasn’t hesitant to admit there’s still work to be done. While there were some down moments for the offense, three players stood out and will have to keep getting better in order for the Indians to have a strong finish against the brunt of their schedule - Nick Pestrichello, Dylan Nees-Fair and Izayah Ciarcia. Pestrichello is in his first season as the starting quarterback for Newington and against Bristol Eastern, showed his ability to make smart decisions. He didn’t make any eye-opening plays but read the defense and was calculated. He threw one interception in the game but that was one of few mistakes the sophomore made on the night. With a sophomore starting in the most critical position on the field, it is always helpful to have playmakers to go with it. Pestrichello has that in the tailback Nees-Fair and wide receiver Izayah Ciarcia. Nees-Fair ran the ball well against Bristol Eastern and finished the game with over 100 rushing yards and showed the ability to be used as a hybrid player, catching the ball out of the backfield. Ciarcia had three touchdown grabs against Bristol Eastern. The three were short. A 3-yard catch, an 8-yard reception and a 4-yard grab for his third score of the night. While they weren’t flashy touchdowns, Pestrichello clearly has trust in the junior wide receiver and that’s invaluable for the Indians’ offensive production. Still, getting shut out in the second half is a learning point against a defense that had issues leading up to the game Friday night. Pace didn’t believe the Lancers defensive unit was indicative of the 41 point per game average they had given up and the 40 points the Lancers had just allowed to Farmington, a team that beat Newington 28-7 earlier in the season. 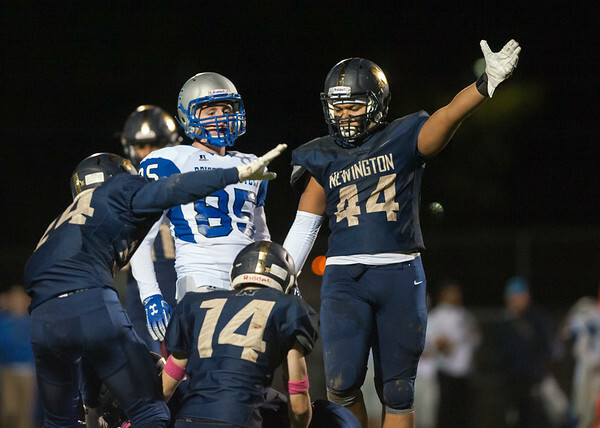 With all three wins up to this point in the year against winless programs, Newington has a lot of work to do with the remaining teams on its schedule a combined 19-6 on the year - Bristol Central, Middletown, Maloney, East Hartford and Wethersfield. Posted in Newington Town Crier, Newington on Sunday, 14 October 2018 20:41. Updated: Sunday, 14 October 2018 20:44.